Director Neil Pepe, more a man of Mamet than musicals (indeed, this is his first), focuses on characterizing each contestant and leaves the hard-driving movement of the show to his choreographer, Sergio Trujillo, who triumphs over the static truck. The show's biggest name, Carradine, is happily the first name out of the hopper for the alphabetical billing. He admitted he was also like the character he was playing. "I like his tenacity. He's probably the oldest person out there, and I like that he considers that a challenge which he has to rise to. I admire that kind of gumption." The all-Green number, "Used to Be," wears well on his wistful rasp. You can almost hear a distinct echo of his own Oscar-winning ditty from "Nashville," "I'm Easy." He still is, too: "I'm very pleased with what they've given me to do. I feel lucky." 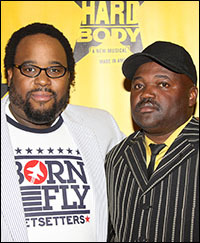 Previously, Hunter met his real-life counterpart, Perkins, when the show had its world premiere at the La Jolla Playhouse and found much in common with him. "I grew up in Georgia so I sorta relate to people like him," the actor said. "He's shrewd and he'll do anything he can to win the competition, but you find there's something in him that comes out in Act Two. To take that journey…is a quite a trip." Jon Rua plays a Mexican-American who wants to sell that damn truck for tuition to a veterinarian school, feels a mild brush of Texas bigotry. "It's very good to finally get that message out there and show it in a way where everyone can understand. We all have been discriminated against to some extent at some time in our lives." The torrid "Born in Laredo" is his big number. "It's a doozy, and I enjoy it. It's an obstacle course because I'm first-generation American as well, so emotionally I know exactly what this individual is going through. To go through it and say those words, you just know that's what you're really dealing with. It's a fight for me." Dale Soules, who debuted in the original production of Hair and introduced Stephen Schwartz's songs "Lion Tamer" and "West End Avenue," in The Magic Show, lurks somewhere in that testy Texas housewife competing for the truck. "That's a long time between original musicals," she laughed (although she covered Mary Louise Wilson in Grey Gardens). William Youmans plays both his roles on the sidelines — one as Soules' stand-by-your-woman spouse and the other a learned medico brought in to explain the physiological damage being done. "I love the show," he stated right out. "I just think it's a very powerful and beautiful show, and I don't think there's anything quite like it on Broadway. Like Shakespeare says, 'The abstract and brief chronicles of the time' — it shows a slice of America the way it actually is right now and deals with so many of the issues that are affecting us today. I think it's a very important show." Ming-Trent was completely undone when introduced to McCowan. "I cried like a baby," he confessed. "I've been working all year trying to play this guy, and when he says, 'You did a good job,' and I started bawling. It was just me crying. He was cool. "You know, you always want to do an authentic piece in theatre — something real. You fight for that, and tonight I got that. I'll always remember it. It's a life changer." Allison Case was impressed with her real-life counterpart. "She's a hoot — seriously, one of the funniest people ever. She's so full of life and joy. She's a nurse now. She didn't marry Greg, her boyfriend in the show, but she's married and has a son now." 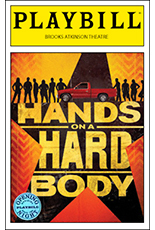 Greg, the boy not of her dreams — a stockboy with stuntman aspirations — is played by Jay Armstrong Johnson, and the two break out into an exuberant dance in the middle of Act One on the flatbed of the truck to a song called "I'm Gone." The scene was easy for him. "I studied dance in Texas. I was a dance major in my performing arts high school, Fort Worth Academy of Fine Arts, so dance is a huge part of my life." The actor figured he was about one degree of separation away from his character. "It feels so surreal to be playing a role that's so close and near and real to who I actually am. I had a dream to leave Texas to go after the arts. Whether it's a stockboy wanting to be stuntman or a grocery cashier being a Broadway actor — I feel very close to Greg. He's a dreamer. He just flicks off things and doesn't think twice of it." The shapely airhead deluded enough to think she has the fix in with management is advanced by Kathleen Elizabeth Monteleone, who has a high old time of it. "What I love about my character is that she has a story that's kind of a secret. People think of her as the blonde bimbo, and she's a scrapper, but she has heart, I like to think. I like to sympathize with her a bit.. Y'know, you get what you see, and I like that." Connie Ray, who did standout work in Next Fall, said her model for the Miss Texas Priss who's judging the contest, was a Barbie doll passing as a business person. David Larsen, playing the soldier-boy in the competition, "What I like about the character so much is you're able to tell the story of our young men and women who are serving in the world right now. I really wanted to bring across the stoic nature of these men who don't really express their feelings but they're able to be, and keep bringing that struggle forward." The hardest working "good ole boy" in show business, Alabama-born Jim Newman, plays a sort of used-car lot version of Gig Young's marathon-dancing emcee in "They Shoot Horses, Don't They?" His Broadway career has run from marathon to marathon — from Steel Pier to this — but he has finally made it out of the competition into the judges stand. "I spent most of my life trying to get rid of my Alabama accent. Now, it's the reason I get hired. We have a lot of Southerners in the cast. Hunter's Georgia. Connie's North Carolina. We have two Texans in the South: Scott Wakefield and Jay Armstrong Johnson. We had a dialogue coach come in originally, and she said, 'You're fine. Get out of here.'" One of the side effects of staying awake and standing up for 91 hours is hysterical laughter, and Settle may well have set a new Guinness World Record for sustained laughter on a Broadway stage. Her opening-night effort clocked in at two minutes and 45 seconds. That may not seem like such a long time, but try to do it with Settle's spontaneity and contagious conviction. It's a small, unending eternity. 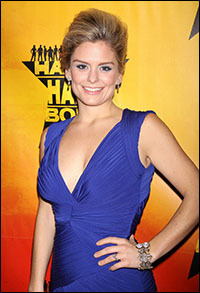 "My laugh comes from the fact that I know it's coming and that I have no other choice but to do it," the actress explained, "but, once that I start, there are three different cast members on the truck who genuinely start laughing at me because they know how much I'm nervous about it — Kathleen Monteleone, Jon Rua and Keith Carradine. The second I hear Keith Carradine, it's all over. His father used to want to make him laugh as a child growing up — just to hear him laugh because he's got the greatest laugh in the world — and Keith and I, during the rehearsal process, would make each other laugh just to get through the rehearsal schedule. When I hear him laugh — it happens without fail — I'm gone." The audience's response to her giddy recitative fuels her as well, she admitted. "I feel it, but, if I don't have all my cast members on the truck with me, I know, for lack of a better word, I'm screwed." Settle, a Hawaiian passing for Mexican here, has already put in years of Bloody Marys and worked with Bartlett Sher on the national tour of South Pacific, and she too exploded into tears on meeting her real McCoy backstage right before she presented Valverde to the audience. "I was shaking, and I couldn't let go of her. I didn't want to let go of her because it was so humbling. And she was so overwhelmed and grateful. I just wanted to bottle her up and put her in my pocket and take her home with me." Relatives of the show's cast and creatives headed the first-nighter list: Green's mom, Phyllis Newman; Carradine's daughter, Martha Plimpton; Trujillo's husband, Jack Noseworthy; and Foster's wife, Jen Cody. Also: producer David Stone and director David Saint; Spelling Bee tunesmith William Finn; The New Group's honcho, Scott Elliott; La Jolla Playhouse artistic director Christopher Ashley; Page McConnell, Jon Fishman and Mike Gordon of Anastasio's Phish group; Stephanie J. Block and Sebastian Arcelus; the show's costume designer, Susan Hilferty; a Next to Normal Tony-winning duo (Alice Ripley and lyricist Brian Yorkey); producers Howard and Janet Kagan; In the Heights Tony winner Lin-Manuel Miranda, currently laboring over his Alexander Hamilton musical; Susan Blackwell, who owns and plays regularly the "Hardbody" documentary; Dogfight's Lindsay Mendez, set March 29 for an "American Songbook" evening with Marco Paguia at Lincoln Center's Kaplan Penthouse; Nice Work If You Can Get It book writer Joe DiPietro; producer Chase Mishkin and director Frank Dunlop; former Phantom Howard McGillin, Frankie James Grande and Isaac Capulto.